We are just minutes before 2008 ends. In brief, let us browse through and quickly recapture what seems to be a very interesting year, here at BigDogDotCom. 2008 started with the Chua Soi Lek scandal and prompt admission. The story which made news and some degree of controversy was when the fourth Prime Minister Tun Dr. Mahathir Mohamad admitted in the VK Lingam tribunal that the Malaysian Prime Minister had the right to appoint judges. In the same month, his gourmet restaurant and bakery The Loaf in Pavillion was launched. In February, it was much more interesting. UMNO Youth Exco and Peace Malaysia Co-ordinator Dato’ Mukhriz Mahathir led a mercy mission to Gaza. Then later in the month, he was nominated to contest in P005 Jerlun Parliamentary seat, under Barisan Nasional. Of course, fifth UMNO President Tun Dr. Mahathir Mohamad, campaigned for his son. Earlier, BigDogDotCom celebrated its first year of operations, whilst on ‘reconnaissance’ mission to Langkawi. March saw a month of roller coaster ride, in Malaysian politics. Mukhriz was elected into the Dewan Rakyat, the same night BN saw the humiliating defeat in 53 years of Malaysian history of democracy by losing Kedah and five other states, which include Wilayah Persekutuan. By morning, Tun Dr. Mahathir urged PM ‘Flip-Flop’ Dato’ Seri Abdullah Ahmad Badawi to resign and within a few days, newly elected BN MP Mukhriz wrote a letter and demanded PM ‘Flip-Flop’ Abdullah to own up for the poorest BN performance and resign from office. UMNO Youth was urged to make a decision on Mukhriz for his bold demand. However UMNO Youth Head Dato’ Seri Hishamuddin Hussein decided otherwise. April equally saw very interesting developments. UMNO Youth Head aspirant Mukhriz, asked for support to correct and rehabilitate UMNO. BigDogDotCom highlighted the personalities of ‘Level Four Boys’. UMNO Johor, the mainstay behind the nationalist party, hit out strong against PM ‘Flip-Flop’ Abdullah. Tun Dr. Mahathir appeared on BBC’s Hard Talk, hosted by the tangy-tongue Stephen Sackur. May saw more interesting events. The High Court ruled that the word ‘Allah’ is not exclusive to depict God by the Muslims only. Tun Dr. Mahathir, an UMNO member since 1946, announced his conditional withdrawal from the party. BigDogDotCom’s article was quoted by The Star and received its millionth visitor. Tun Dr. Mahathir urged BN MPs to leave the coalition, in attempt to drive PM ‘Flip-Flop’ Abdullah out of office.Then there is the humiliating defeat to the Pulau Batu Puteh case. June was a month of controversials. The Federal Government abruptly announced the exhorbitant increase of retail price for petrol and diesel, which is deemed to be burdening the rakyat. PM ‘Flip-Flop’ Abdullah, being conned by defacto Law Minister Zaid Ibrahim, announced the ex-gratia payments to the 1988 sacked Lord President Tun Salleh Abas and five other senior Judges. Tan Sri Sanusi Junid service as the IIUM President was prematurely terminated whilst very senior UMNO leaders strongly urged PM ‘Flip-Flop’ Abdullah to withdraw from office, in the UMNO retreat in Shah Alam. High Court Judge Ian Chin’s controversial statement, which did not go well even with former Attorney General. Tun Dr. Mahathir explained that the Malays have the right to stake their claim for their share of the wealth of this nation, without eating into others’. Riong Kali, as usual, tried to demonize Tun Dr. Mahathir with distorted facts. One of BN component party, SAPP announced their withdrawal from the coalition. For 2008, nothing could beat the adrenaline of month of July. First was the caution and later the call to end speculative oil trading, which is the main factor world economy is brought down to its knees. Then its about a month of highly controversial SDs. Of course, nothing beats Raja Petra’s ultra controverisal expose, of which include the Military Intelligence Chief media statement on the issue. Then the announcement of the ‘Power Transition’ in UMNO Leadership. Its about the Drama King and also, Drama Queen, with some new twist to an old drama script. Of course, former power abuse convict Anwar Ibrahim, being in the Neo Conservative equation of world dominance gets the sympathy and support of some foreign powers. Three pertinent questions, raised in the Dewan Rakyat about Anwar, was never answered by him or any of his ardent supporters. August was equally emotionally charged and nerve wrecking. UMNO leaders urged PM ‘Flip-Flop’ Abdullah be investigated for wrongful use of Government machineries to campaign for party elections. Saiful Bukhary, who alleged Anwar sodomised him, went to swore on the Quran before an imam in a mosque. Noteable trial lawyer Muhammad Shafiee Abdullah sued Raja Petra and Malaysia Today, for lies. Bar Council is lambasted for trying to stir up racial and religious controversies, from their attempts on “intelectual discourse”, like the one about ‘Ketuanan Melayu and Social Contract’ forum in June. Anwar, who is vying back into Parliament, have riddiculous hopes of forming a Government by 16 September 2008. This is something Mukhriz and Tun Dr. Mahathir described as “halucinating” and “making excuses”, when he will never ever able to realise that ‘promise’. September saw the month of UMNO leaders gearing up for nominations, as annual meetings will start within the month’s time. UMNO Youth Exco Mukhriz announced his ‘Berani Berubah’ campaign for the movement top job. Highly controversial defacto Law Minister Zaid Ibrahim resigned and Anwar Ibrahim, now deemed a ‘short seller and compulsive liar’. We at BigDogDotCom made a projection of retail petrol going at RM 2.0o/litre and was honoured when Tun Dr. Mahathir dedicated his “Blogging to unblock” book, based on his infamous blog chedet.com. PM ‘Flip-Flop’ Abdullah had the intention not carry on with the announced ‘Transition of Power Plan’ due March 2009, but had stern opposition even at UMNO MT level. Of course, UMNO members are skeptical about PM ‘Flip-Flop’ Abdullah not doing the ‘Flip-Flopping’. October was a month of equally adrenaline and fun, especially UMNO divisional meetings started, which will determine the nominations for party elections in March 2009. On the adrenaline worry and fear of many of sordid and deperate attempts to disfulfilling promises and salvage position and popularity within UMNO, PM ‘Flip-Flop’ Abdullah finally announced not defending the UMNO Presidency, which provided relief to many. UMNO Deputy President aspirant Tan Sri Muhyiddin Mohd. Yasin announces his candidacy. Tun Dr. Mahathir warned for ‘Level Four Boys’ influence beyond PM ‘Flip-Flop’ Abdullah’s departure. Mukhriz was the first UMNO Youth Head aspirant to qualify. Tun Dr. Mahathir was honoured along with upcoming UMNO President Dato’ Seri Mohd. Najib Tun Razak and aspirant UMNO Deputy President Tan Sri Muhyiddin Mohd. Yasin. MCA asked for a second BN Deputy Chairmanship, without them earning their notch, especially after poor performace during the XII General Elections. A upcoming Prime Minister Dato’ Seri Najib’s own ‘Level Four Boys’ aspirant Omar Ong was bashed by Tun Dr. Mahathir. November was neither a walk in park. Inadvertently after much controversies, High Court Judge Ian Chin finally ‘bites the dust’. The pro-Riong Kali again tried to demonize Tun Dr. Mahathir for the latter’s ‘Mahathirism policies’, which actually brought progress and positive nodes to Malaysia. Latest pictures of the ‘Houses on Mosman Park’, which are closely linked to outgoing PM ‘Flip-Flop’ Abdullah was highlighted here in BigDogDotCom. The highly controversial bar brawl which started by a grandson of a Soveriegn Ruler, was highlighted by the pro-Riong Kali news portal and Straits Times of Sinagpore, for very cunning reasons. Aspirant UMNO Youth Head Dr. Khir Toyo supporters were blasted for reacting adversely to former UMNO President Tun Dr. Mahathir’s call to do away with leaders who have the tendency to do corrupt practices. MCA Deputy President Dr. Chua Soi Lek, who managed to make a political comeback despite first day of the year scandal, stirred up another controversy. December was the month which closes 2008 but not without a bang! Mukhriz demanded that vernacular schools are done away in favour of a single school system, seen as a reaction against Dr Chua’s ‘Kurang Ajar’ call. This call is something sucessfully implemented in Singapore and required political will, which something MCA and Gerakan as BN component parties always conveniently forget. On Christmas day, the minorities now insult the majorities by demanding the Malay language allowed for the Bible. The pro-Riong Kali news portal tried to spin on the failed ascension of Tunku Laksmana Negeri Sembilan Tunku Naquiyuddin as the XI Yam Tuan, especially after the Undang Royal Court made their democratic decision deemed best for Islam and the Malay heritage and culture. 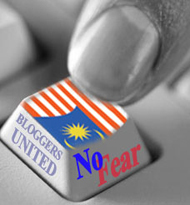 Tun Dr. Mahathir’s infamous blog, chedet.com, has now migrated to a new home. In all, 2008 was a very good year for BigDogDotCom. Thank you, to all. All the best for 2009. From midnight tonight, chedet.com will cease to operate from this address and will be accessible through http://www.chedet.cc. There will be almost zero disruption as all those who have registered as users/commenters need not re-register and can still submit feedbacks as usual. It is available for view now but will not be moderated until after midnight. http://www.chedet.com will still be accessible. However, it will no longer be updated and moderated and will be kept in its present state as archival material for a period of time. Look out for chedet’s next posting at http://www.chedet.cc. The Israeli aggression against the defenceless Palestinian people continues unabated. The death toll now stands at 400 innocent lives and scores others seriously injured with grave warnings that more lives will be lost as the Zionist regime mobilises its ground forces for a bloody incursion into the Gaza strip. This senseless and indiscriminate killing must cease and desist at once for this murderous act by the Israeli government is in contravention with the tenets of established international law, the Geneva Conventions and United Nations Resolutions. The Zionist regime with the support and complicity of the United States must be strongly condemned by the international community as a flagrant denigration of basic human rights. Therefore, we urge The Ministry of Foreign Affairs (Wisma Putra) to move a motion at the United Nations (UN) to immediately organize and dispatch a ‘UN Humanitarian Task Force’ to alleviate the suffering of the Palestinian people in the Gaza Strip. We also demand that the UN censures Israel for its abhorrent conduct and the United States for its complicity in this act of state sponsored terrorism. In this regard, we are prepared to extend aid and assistance to our Palestinian brethren. For your information Kassem Aina of the National Institution of Social Care and Vocational Training (NISCVT) is organizing humanitarian aid in the form of essential food items such as milk and medicine. Monetary donations are welcomed. Contributions can be sent as ‘Donations for Children’ to the National Institution of Social Care and Vocational Training- Account number: 000 1 10684 5002- First National Bank, Immobilita Building- SWIFT Code: FINKLBBE, Hamra Street , PO Box 113-5453. Beirut, Lebanon. The spinmaestro never did get it. The appointment of DYMM Tuanku Muhriz Ibni Almarhum Tuanku Munawer as the XI Yam Tuan Negeri Sembilan has nothing to do with bad presses against and on the Almarhum DYMM Tuanku Jaafar Ibni Almarhum Tuanku Abdul Rahman’s immediately family. It is all about perceived scandals, one on top of the other. Furthermore, it has been going on for years. These scandals, which are deemed self-inflicted wounds that the family do onto themselves, consciously. They have lead a lifestyle which has been perceived as a very liberal and unbecoming their stature as members of the ruling monarch for a Royal Household, traditionally known and very respected for the Islamic and deep heritage practices and adat. For the custodian of the rich traditions of Adat Perpatih, which is very Islamic in its philosophy, living a near decadent lifestyle will never go down good with the common rakyat’s aspirations and more often regarded as an insult to their Negeri Sembilan Malay identity. As been said before, a Sovereign Ruler role is expected to be the ceremonial figurehead in Islamic affairs and matters involving the Malay heritage, traditions and culture. Of course, in the age where information travel so seamlessly, these precarious opulent practices is not welcomed and sometime loathed by the common rakyat. On top of that, the awareness of moving towards righteousness, especially from the context of Islam is more apparent, presently even amongst the most affluent Malay societies. It is never a surprise when the Undang Royal Court made the final decision, and for the common rakyat, that is something deemed to be the best. Live on national TV, one could actually saw the relief and joy explicitly expressed by those attended the proclamation ceremony of the XI Yam Tuan Besar Negeri Sembilan, even though the event should have been a sombre one. Especially, when the remains of the X Yam Tuan Negeri Sembilan is still lying on a pedestal at the forefront of the dais. Being a thoroughbred Minangkabau prince, also seals the deal. The blood linage is deemed kept intact, with the appointment DTYM Tunku Muhriz, again in the Royal Household with very rich traditions and heritage. How come Malaysia Insider is trying to spin the stories around, against what actually the common rakyat set to believe, based on very common knowledge? Don’t they know when and where to quit? Can they actually believe that this sordid but lame attempt to spin will remotely work and not change the perception of the rakyat, especially the amongst most affluent and IT savvy Malays, and the story will not hold water? The fact that Malaysian Insider got it wrong is also bewildering. Tuanku Muhriz had never by-passed Tunku Naquiyuddin for the appointment of the XI Yam Tuan Almarhum Tuanku Jaafar, then a career diplomat was chosen by the Undang Royal Court in 1967 because Tuanku Muhriz then was still too young. Unlike other Royal Households where the appointment of a Ruler is hereditary, the Undang Law states that the Undang Royal Court will convene whenever they have to decide on the Yam Tuan. It means that being a Tunku Laksmana, Tunku Naquiyuddin’s ascension into the Negeri Sembilan throne is not an automatic process. Again, its never about bad image from the media, whether real or perceived. When one arrogantly live an opulent lifestyle blatantly for decades, eventually the truth and righteousness will catch up and prevail. The members of the Undang Royal Court chosen the right path of the Islamic principles to discharge their duties, even in deadlock situation as over the weekend. That is actually the fundamentals which the Adat Perpatih closely guarded in its strict traditions. The international community must condemn the abhorrent and blatant aggression by the Zionist state of Israel perpetrated against the innocent and defenceless Palestinians living in the Gaza strip that has so far claimed at least 250 lives and wounding 700 people. We exhort the Organisation of the Islamic Conference (OIC) to stand in unity with our Palestinian brethren against the state sponsored acts of terrorism intended to inflict irreparable damage to the meagre existence of a people robbed of their land by Israel and its allies. Muslims all over the world strongly condemn the murderous attacks that have not spared the old, women and children. Furthermore, the Israeli Defence Forces (IDF) is deliberately targeting civilian targets when it bombed Gaza’s Islamic University. We call upon the world’s Muslims to be steadfast in rejecting this act of terror that has the tacit support of the United States. The people of Malaysia denounce Israel’s military operations and call for the Israeli government to forthwith cease and desist its attacks on the densely populated Gaza Strip. Israel has neither the moral high ground nor the legitimacy in carrying out its actions. The IDF has stoked the anger of peace loving citizens throughout the world and must therefore halt the mobilisation of its troops along the Gaza Strip border with Israel. In this regard, we are prepared to volunteer and extend humanitarian assistance to the Palestinian people in their hour of need. For your information Kassem Aina of the National Institution of Social Care and Vocational Training (NISCVT) is organizing humanitarian aid in the form of essential food items such as milk and medicine. Monetary donations are welcomed. Contributions can be sent as ‘Donations for Children’ to the National Institution of Social Care and Vocational Training-Account number: 000 1 10684 5002- First National Bank, Immobilita Building– SWIFT Code: FINKLBBE, Hamra Street, PO Box 113-5453. Beirut, Lebanon. When it comes to an issue of appointment of a Sovereign Ruler, there is always the aspiration of the rakyat wanting their say in the criterion. As the appointment has never been democratized, therefore the aspirations, based on the set expectations and values that is closer to the rakyat will never be realised. However, when some degree of the ‘democratization’ is ‘opened’, then the rakyat would very much want some aspect of their aspirations fulfilled. A Sovereign Ruler, one of the nine hereditary rulers constitutionally provided within the Malaysian political realms, has two pertinent roles. Their absolute power on issues governing Islam and the Malay heritage and culture, which binds the nation together, especially amongst the Malays who are the majority of the populous. Being the custodian and defender of the Islamic faith and the head of Malay traditions and heritage, they are expected to live a life that befits the role and responsibility that have bestowed upon them. As they say, not only they have to lead a respectable lifestyle as a Sovereign and Hereditary Ruler, they must also be perceived to do so. More so, their personal integrity should be also under scrutiny. These are the virtues nowadays many no longer willing to compromise, regardless how traditionally the common rakyat, especially the Malays live up to the feudalism and the colourful history that comes with it, as part of the Malaysian identity. However, some do not. Their liberalized ‘western-like’ and bourgeoisie lifestyles, totally contradicts their roles and what has been expected onto them. Bad enough if these decadent or somewhat near bohemian lifestyles are done in private and away from the public knowledge. Some thrived on these ‘parties’ an ‘cocktail dos’ being published on almost as a permanent feature on the periodicals that will be in hands of Malaysia’s most affluent personalities and socialites. These opulent lifestyles, with their social arrogance of not sensitive to the feelings of the common rakyat should be regarded as a disgrace to the position that the system place them. Regretfully, humility is never described as one of their traits. Then, when there exist issues that does not befits the stature of the family they represent, sometimes evolves into something really complicated. Example when a brawl which someone started was brought into public knowledge, especially the settlement demand of the exorbitant sum of RM 50 million! The decision makers on this private and very close ‘democratization’ process of installing a Sovereign and Hereditary Ruler should consider all these, especially the expectations, based on values of the common rakyat. The integrity of the Ruling Household must be protected, for the right reasons. The Malay heritage, is a supreme realm that must live forever, in the hands of the people which God chooses. Hence, they should be God fearing people, as an example for the common rakyat. Benarkan Bahasa Melayu untuk injil: Bagi betis, hendak peha pula! Ada pepatah Melayu, “Bagi betis, hendak peha”. Setelah Mahkamah memutuskan bahawa perkataan ‘Allah’ dibenarkan digunakan sebagai gantinama Tuhan oleh orang Kristian, kini mubaligh mereka mahukan dakwah ugama nasrani ini dibenarkan dalam bahasa Melayu pula, iaitu bahasa kebangsaan. PETALING JAYA: The Christian Federation of Malaysia (CFM) has called on the Government to re-look its restriction on Bibles written in Bahasa Malaysia. “Though special exemption was made for this Bible to be used by Christians in churches, in this modern day and age when almost anything can be accessed on the Internet, it is regrettable that our Holy Scriptures are still seen as ‘prejudicial to the security’ of the country,” Dr Eu said. Dr Eu made this suggestion at the CFM’s open house which Prime Minister Datuk Seri Abdullah Ahmad Badawi attended, referring to a previous statement that Abdullah had made, saying that his last mission before he leaves office next March would be to cool racial and religious tensions in the country. “This is our wish for Christmas and we know these things will certainly ease tensions and it will definitely have a positive impact on your legacy,” Dr Eu said. He also thanked Abdullah for opening up democratic space, which has brought greater freedom of expression. He also pledged that the CFM would stand committed to and fervent in nation building. Bahasa Melayu ialah bahasa ibunda lebih 17 juta rakyat Malaysia. Jika dikaji dari sudut kesesuaian pengunaan Bahasa Melayu dalam injil dan khutbah gereja pula, persepsi yang melambangkan golongan yang mewakili pengunaan bahasa itu perlu sangat diambil kira. Definisi ‘Melayu’ itu ialah “Orang berketurunan Melayu, mengamalkan budaya, adat resam dan cara hidup orang Melayu dan berugama Islam”. Ini bermakna, Bahasa Melayu merupakan bahasa yang digunakan sebagai bahasa ibunda oleh orang orang yang ‘berketurunan Melayu, mengamalkan budaya, adat resam dan cara hidup orang Melayu dan berugama Islam’. Oleh demikian, pengunaan Bahasa Melayu dalam dakwah Kristian melambangkan bahawa proses pengkristianan orang Melayu Malaysia, secara terancang dan berstruktur, sudah bermula dan berlaku dengan secara terbuka, termasuk mendapat ‘kebenaran’ pihak berkuasa. Ini adalah sesuatu permintaan yang wajar dikira sebagai ‘Kurang Ajar’, terutama sekali semasa perayaan Hari Krismas; perayaan suci memperingati kelahiran Nabi Isa A.S., yang mensyirikan tauhid ugama Kristian sebagai ‘Anak Tuhan’. Dalam masyarakat majoriti Islam Malaysia, sesuai dengan semangat muhibbah dan saling menghormati antara kaum dan kepercayaan ugama, toleransi menghormati hak rakyat Malaysia yang tidak mengamalkan ‘Ugama Persekutuan Malaysia’ iaitu Islam dijaga. Maka dengan itu, perayaan Hari Krismas, walaupun hanya melibatkan golongan minoriti, masih lagi diberikan penghormatan dan diberikan cuti umum. Berbanding dengan negara dimana ugama rasmi ialah Kristian seperti UK, perayaan orang Islam seperti Eidul Fitri tidak diiktiraf langsung. Permintaan NGO Kristian ini sama sekali tidak sepatutnya berlaku. Had menghormati hak dan peluang dan ruang untuk mereka mengamalkan ugama mereka, selagi tidak bercanggah dengan Islam sebagai ugama Persekutuan Malaysia dan kepentingan memelihara kedudukan Islam kepada orang Melayu, warga majoriti tanahair perlu dipertimbangkan dan tidak dilanggari., walaupun dengan apa sudut intepretasi yang diberikan. Namun atas apa jua alasan, sejajar dengan arus globalisasi dan keterbukaan masyarakat dunia mempunyai akses kepada jaringan maklumat, had ini perlu dihormati dan pantau, agar ‘toleransi’ yang golongan majoriti berikan itu tidak dicalari dengan cabaran ala intelektual. Kepentingan mengada had ini bukan setakat memelihara persepsi semata mata. Dalam keadaan dimana maklumat, termasuk dakwah sengaja disalurkan secara licik mengunakan pelbagai media, samada secara tersurat atau tersirat, dijangkakan akan memberikan kesan strategik kepada orang Melayu. Lebih lebih lagi pendekatan, medium dan kaedah mengunakan alat hiburan, alat propaganda seperti media eletronik, secara halus akan mempengaruhi akal dan lambat laun, akidah orang Islam. Apatah lagi sekiranya medium ini dimudahkan dengan dibenarkan dalam Bahasa Melayu, bahasa ibunda majoriti rakyat Malaysia. Dunia hiburan semasa dengan imbuhan teknologi terkini, ialah alatan propaganda paling effektif untuk mempengaruhi minda orang Melayu-Islam, terutama golongan muda. Sekiranya propaganda dan ‘dakwah strategik’ ini berterusan secara terancang, terurat dan tersirat, dan orang Melayu mempunyai rujukan mudah iaitu injil dalam Bahasa Melayu, apakah akan berlaku kepada iman anak muda Melayu, sekarang dan akan datang? Persoalan sekarang, dimana had kemahuan dan permintaan golongan minoriti negara ini berbanding dengan menjaga kepentingan, perasaan dan maruah golongan majoriti, dengan memanipulasikan ‘toleransi, menghormati hak orang lain, semangat muhibbah dan keperluan untuk bergerak maju kehadapan sejajar dengan arus globalisasi’. Lebih lebih lagi, sudut perundangan, nilai sejagat dan hak asasi diperkuda dan manipulasikan sebegitu rupa, sehingga menghalang permintaan dan tidak membenarkan sering kali dipertontonkan kepada dunia luar sebagai “Majoriti menindas hak dan kepentingan minoriti”. Dalam konteks ‘bahasa dan toleransi’ ini, baru baru ini golongan minoriti ini juga yang begitu lantang mempertahankan kunun kunun ‘hak’ mereka mengekalkan sekolah vernakular, walaupun Perlembagaan Persekutuan Malaysia memberikan tafsiran berbeza. Menarik balik kemudahan (privilege) yang mereka anggap sebagai ‘hak’ ini akan sewenang wenangnya dikudakan sebagai menafikan hak asasi mereka dan ini akan dipolitikan, bukan setakat dalam negara, malah dipersada antarabangsa. Jelas bahawa golongan minoriti ini menghamburkan kedudukan ‘hak’ atas kepentingan mereka dan memanipulasikan keadaan, atas kesesuaian keadaan. Permintaan ini secara tidak langsung memberi kesan moral kepada kedudukan mutlak kuasa Raja Raja Melayu keatas Islam sebagai tunggak ugama Persekutuan Malaysia dan kebudayaan Melayu dimana merangkumi Bahasa Melayu, kini sengaja dicabar secara terancang. Apakah orang Melayu, sebagai kekuatan asas politik yang mendukung kuasa memerintah Malaysia semenjak Merdeka, akan membuat kompromi sekali lagi, atas alasan lemah ‘toleransi dan semangat menghormati hak orang lain’ dan membiarkan Bahasa Melayu yang melambangkan jiwa Bangsa Melayu di’sundal’kan, membelakangkan ‘roh’ definisi Melayu itu sendiri? Glad tidings. We at BigDogDotCom wish to offer our utmost warmest greetings of Merry Christmas to all. Perlaksanaan sistem sekolah satu aliran secara komprehensif perlu dibuat sekarang dimana keadaan, masa dan peluang sudah tiba untuk menyaksikan perubahan ini, bagi menentukan keutuhan Malaysia sebagai negara majmuk pelbagai keturunan dan kepercayaan berjaya dipupuk dan bangunkan bersama, dengan penuh semangat toleransi, kesefahaman, muhibbah dan setiakawan. Perlaksanaanya sekarang, akan memberikan impak positif dan progressif secara strategik. Persoalanya sekarang, apakah ada kesungguhan politik (political will) untuk melaksanakan apa yang wajar? Soal sistem satu sekolah yang ditimbulkan secara lantang baru baru ini, oleh Exco Pemuda UMNO YB Dato’ Mukhriz Mahathir MP Jerlun, dilihat sebagai respons semasa isu kontroversi ‘Ketuanan Melayu’ dibangkitkan Timbalan Presiden MCA Dato’ Seri Chua Soi Lek, disambut Ketua Wanita MCA Dato’ Paduka Chew Mei Fun dan sebelum itu kenyataan Timbalan Menteri Penerangan Tan Lian Hoe, yang juga Ketua Wanita Gerakan, sebenarnya perlu dilihat dari sudut terbuka dan objektif. Ini kerana asas permintaan Mukhriz itu ialah berdasarkan peruntukan undang undang, sebagaimana termaktub dalam Perlembagaan Persekutuan Malaysia. Akta Pendidikan 1996 menguatkan lagi kedudukan peruntukan bahawa Bahasa Malaysia (Melayu) sebagai bahasa penghantar semua sekolah dalam Malaysia, memberikan tafsiran yang lebih jelas dan sekaligus, mengantikan Akta Pelajaran 1961, yang berlandaskan Penyata Razak 1956. Ini bermakna kedudukan dan peranan sekolah vernakular tidak relevan lagi, dalam konteks Malaysia hari ini. Peruntukan perundangan, walaupun dicapai secara demokrasi, perlu ada tindakan untuk ianya member kesan kepada rakyat. Kerajaan perlu, sebagai ‘pemegang amanah pengurusan negara’, perlu secara serious menimbangkan kedudukan perundangan yang mereka taja sendiri itu sehingga diluluskan Parlimen. Kesungguhan politik (political will) amat perlu untuk tindakan yang terbaik berjaya diusahakan dan keperluan untuk ianya dilaksana secara konsisten. Perlaksanaan sistem satu sekolah akan menerima reaksi negatif, terutama masyarakat Bukan Melayu iaitu keturunan Cina. Mereka dijangkakan akan mempertahankan sistem sekolah vernakular dengan alasan bahawa hak mengamalkan budaya merupakan sesuatu yang amat penting dipelihara, sejajar dengan peruntukan Perlembagaan Persekutuan. Namun begitu, perlaksanaan sekolah satu sistem merupakan tuntutan Perlembagaan Persekutuan juga. Perlaksanaan ini, akan memberikan impak positif dan progressif, dari agenda intergrasi nasional; satu ciri amat penting bagi Malaysia sebagai negara untuk melangkah kehadapan dalam cabaran globalisasi. Ini dengan jelas, memilih untuk memberikan kepentingan peruntukan perundangan ini mempunyai merit lebih dari yang satu lagi. Hakikatnya, kesungguhan politik (political will) Kerajaan selama ini gagal. Sebagai contoh, Akta Pendidikan 1996 yang sepatutnya dilaksanakan, diketepikan dan sebaliknya apa yang berlaku ialah songsang dari sebagaimana yang diputuskan melalui forum paling mulia negara; Parlimen. Dalam tempoh antara PRU XI dan XII, sebanyak 12 sekolah vernakular Cina baru dibenarkan untuk diujudkan, dimana 6 daripadanya di Selangor. Persoalan sekarang ialah, walaupun Kerajaan BN begitu menatang permintaan politik pengundi keturunan Cina, sehingga pemimpin parti komponen BN hari ini ‘lupa’ bahawa asas sokongan dan kuasa yang ada pada mereka sebenarnya tidak datang dari usaha keras mereka sendiri. Dalam pada itu hakikatnya, pada PRU XII, pengundi Cina masih lagi member undi kepada parti sehingga mengakibatkan Selangor terlepas dari BN. Oleh demikian, apa pertimbangan lagi perlu diambil kira, setelah majoriti rakyat Malaysia mengenepikan agenda nasional untuk menjaga hati dan kepentingan minoriti, yang akhirnya tidak dihargai pun? Keadaan sudah boleh dikira terdesak dimana perlu ada kommitmen ‘Berani Berubah’ oleh Kepimpinan UMNO dan sifat kesediaan orang Melayu sebagai warga majoriti dan tulang belakang sokongan dan kekuatan BN selama ini untuk ‘bertolak ansur’ dan memberi pelbagai konsessi secara berterusan perlu dihargai dan tidak lagi diambil kesempatan. ‘Maruah politik’ orang Melayu perlu dibela dan pelajaran, sebagai asas ketamaddunan sesuatu bangsa merupakan titik tolak perubahan pembelaan itu. Inilah percaturan politik (political gamble) yang Kerajaan perlu timbangkan secara serious dititik persimpangan ini, dengan mengambil kira variable senario politik semasa (pemimpin parti komponen BN hari ini sudah pun secara lantang membelakangkan konsep sebenar ‘Kongsi Kuasa’ dan memomokan ‘Ketuanan Melayu’, sehingga sampai tahap “menghina”), kepentingan strategik negara (ciri utama integrasi nasional untuk menentukan Malaysia maju secara bersepadu) dan keberkesanan perlaksanaan dasar ini dilaksanakan dinegara lain (yang nyata komposisi kaum negara itu sepatutnya memberikan kelebihan kepada kehendak minoriti negara ini). Modal Insan merupakan rancangan strategik PM ‘Flip-Flop’ Dato’ Seri Abdullah Ahmad Badawi untuk membangunkan asset terpenting negara, iatu guna pakai tenaga kerja dan minda generasi muda, agar digembelingkan kearah merealisasikan perancangan untuk menjadi Malaysia sebagai sebuah negara maju dan moden. Namun begitu, apakah pencapaian sebenar rancangan strategik menepati sasaran sebenar, iaitu kualiti dan nilai dalam modal insan yang begitu pesat diwar warkan untuk dibangunkan itu. Modal Insan menjadi agenda teras Kerajaan PM ‘Flip-Flop’ Abdullah, semenjak Hari Kebangsaan 2005. Pembangunan fizikal generasi muda begitu diberikan penekanan dan tumpuan. Namun begitu, pembangunan fizikal sebenarnya tidak mempunyai erti lengkap dan komprehensif, sekiranya ianya tidak dibangunkan dengan komponen ‘perisian’ (software) seseorang insan, samada individu maupun secara kolektif. Hari ini, jika dikaji secara sekali pandang, pusat pusat ilmu, akademik dan latihan kepakaran, seperti IPTA dan IPTS samada universiti atau universiti kolej, politeknik, kolej kommuniti, institut latihan, pusat matrikulasi dan sekolah berasrama penuh begitu intensif dibina dan majukan secara fizikal dam berstruktur. Penekanan diberikan khusus kepada proses pembelajaran, yang rata rata berpaksi kepada sistem peperiksaan dan penilaian bedasarkan objektiviti. Pusat pusat ilmu ini, samada peringkat sekolah menengah, maupun menara gading begitu mengutamakan keputusan yang bakal dicapai. Kuantiti merupakan sasaran utama. Rata rata, pencapaian seperti 17A diperingkat SPM dan berapa ramai lulusan CGPA 2.5 mata keatas menjadi ukur tara pengurusan pusat. Siri penekanan terhadap mencapai sasaran ini berubah menjadi peringkat hampir ‘taksub’, sehinggakan komponen lain dalam proses pembelajaran dikurangkan, sehingga mencapai tahap ‘diabaikan’ sama sekali. Akibatnya, pelajar, samada diperingkat sekolah menengah, maupun universiti (sekolah peringkat teratas), gagal merealisasikan diri mereka dengan segala peluang yang mampu dijana dan dedahkan, termasuk pembangunan insan peringkat individu dan mikro. Kecermelangan akademik, yang di’tambat’ dengan pendoktinasian kerohanian secara ritualistik berbanding dengan pendedahan keagamaan secara holistik dan falsafah, menjadi teras missi golongan pengurusan akademik. Akhirnya, penekanan yang tidak seimbang ini membatasi keutamaan membangunkan ‘perisian’ (software) seseorang insan, seperti kemampuan berfikir, kommunikasi, bersukan dan semangat kesukanan, jatidiri, nasionalism dan patriotism dan daya berdikari. Kebolehan untuk menyuarakan pendapat, terutama secara konstruktif juga terhad. Pembangunan seni dan sastera juga menjadi sesuatu yang diabaikan. Kemahiran khusus (skill set) merupakan suatu yang hampir tidak ujud. Disiplin, samada fizikal maupun mental, menjadi masalah yang makin meruncing. Dirumuskan ringkas: golongan pelajar, di’proses’ dalam ‘kilang akademia’ untuk menjadi hanya. graduan dan lulusan untuk melengkapkan statistik. Kerap kali, ianya tidak lebih dari itu. Produk ‘kilang akademia’ ini menjadi bahan pengeluaran yang begitu generik. Ianya terlalu generik, sehinggakan untuk guna tenaga dan minda lulusan ‘kilang akademik’ ini menjadi masalah untuk dipasarkan. Ini kerana selain dari kelulusan yang dicapai, rata rata ‘produk kilang akademia’ ini tidak mempunyai nilai yang dikehendaki oleh pasaran kerja dan industri. Kelemahan berfikir, kommukasi, menyuarakan pendapat dan pemikiran secara berstruktur, ‘kedaifan’ ko-kurrikular menjadi rungutan utama pengamal modal insan dan pembangunan sumber manusia. Kemampuan organisasi (organisational skill) dikalangan graduan juga diragukan. Rata rata, graduan dikatakan terlalu manja, berkemungkinan kerana banyak proses di’suap’ (spoon fed) semasa dalam ‘kilang akademia’ dan daya saing untuk ‘mencari maklumat melalui penemuan’ (learning by discovery) sudah hampir lenyap sama sekali. Oleh kerana produk ‘kilang akademia’ ini dilambakan dalam pasaran yang terhad, jumlah mereka yang diterima pakai industri amat rendah, terutama dikalangan lulusan Melayu. Rata rata, lulusan dikalangan orang Melayu ini sukar dipasarkan. Itu belum lagi dirumitkan dengan sikap golongan ini, yang acap kali dilihat sebagai ‘memilih’ dalam mengisi kekosongan pasaran guna tenaga. Unsur materialism songsang, terutama apabila pembiayaan pengajian begitu dimudahkan dan proses penghargaan (validasi) keatas pencapaian yang rendah, mengakibatkan fenomena ‘keserdehanaan dirayakan’ (celebrating mediocrity) dengan pelbagai kemewahan berbanding dengan menobatkan persaingan dan kecemerlangan. Ini merebak sehingga menular melalui pembangunan sikap, dalam sistem pengeluaran ‘kilang akademia’ ini dan merumitkan pembinaan sikap para graduan. Pendekata, mereka menjadi ultra-manja! Akibatnya, lebih 90,000 graduan IPTA/IPTS menjadi penggangur dan majoriti dikalangan orang Melayu. Ini merupakan 0.3% dari jumlah penduduk dan hampir 1% dari jumlah besar guna tenaga negara. Jika diambil dari peratusan golongan guna tenaga peringkat pengurusan, professional dan professional bersekutu, jumlah penganggur ini merupakan hampir 4%. Ini merupakan statistik yang wajar menjadi kebimbangan negara, terutama orang Melayu. Yang memburukan keadaan, dalam situasi meruncing dengan sebegitu ramai penggangur itu, golongan ini masih berharap agar Kerajaan dan pihak berkuasa berusaha untuk mengujudkan pasaran guna tenaga dan ‘menatang’ mereka. Ini mengujudkan sikap ‘alpa dan bersahaja’ (complacency) dan penghabisnya, majoriti golongan ini menjadi basian dan terlerai rugi sebagai modal insan yang tidak berjaya diguna pakai. Berbanding dengan golongan yang sama Bukan Melayu, sistem nilai masyarakat menjadikan golongan graduan mereka berbeza. Sikap tidak memilih kerja dan daya untuk membuktikan kemampuan, semangat bersaing dan sikap pengantungan kepada pencapaian sendiri untuk menentukan survival merupakan nilai yang menjadi daya mereka untuk dipasarkan dalam industri dan sistem pemilihan guna tenaga jauh berbeza dan ketara. Oleh demikian, mereka mudah diserap kedalam pasaran guna tenaga jauh lebih baik dari orang Melayu. Tahun demi tahun, ‘kilang akademia’ ini melahirkan berpuluh ribu produk generik yang hampir tidak laku dipasaran guna tenaga, berbanding dengan permintaan pasaran dan jumlah yang mampu diisi. Akhirnya, ianya menjadi masalah yang bertimpa dan saban tahun, ianya makin meruncing. Akan berlaku kuantiti ‘penganggur terhormat’ ini akan menjadi masalah sosial negara dan orang Melayu. Anjakan paradigm, terutama sikap, keterampilan, kemampuan berfikir, kommunikasi dan menyuarakan pendapat secara konstruktf perlu diberikan penekanan semula oleh seluruh sistem pengurusan akademik, secara holistik. Itu belum lagi semangat nasionalism, patriotism dan kepimpinan yang makin hari semakin tiris dalam sanubari generasi muda dan terpelajar orang Melayu. Usaha ini perlu dijana, gembeling dan ko-ordinasi secara strategik dan intensif, bermula sekarang. Proses mencari salah dan menuding jari bukanlah penyelesaian terbaik kemelut kompleks ini. Diambang kegawatan ekonomi global ini, semua pihak, samada Kerajaan, pentadbir dan pengurusan, perancang dan pengamal akademik dan keluarga sendiri, perlu mengambil tindakan drastik, proaktif dan konsisten, agar asset terpenting yang diberikan segala harapan untuk satu hari membela agama, bangsa dan tanahair ini tidak terlerai rugi dalam arus dinamik globalisasi.